So much for Alphonse. First time as tragedy, second time as farce. So. What’s everybody working on? Perhaps I’m your mother stalking you or you’re an anti abortionist, which would have more validity although not justification for mutilating a female. The thighs are also affected. It may even be that the foetus is not alive till it is born, despite the ‘kicking’. And that the father is sometimes an anti-biotic. I did also think, on a different subject, that the sun might be a reflection of the earth. I’d thought before that the moon was some kind of light but it hadn’t occurred to me the reflection idea. Louise, apologies for any confusion. That headline and photo is taken from a satirical newspaper, The Onion. It isn’t real. I say this about the beginning of life with some empirical knowledge in that I have seen ‘worms’ emerging from orange and lime fibres. I am not the only one to have thought of this. They hint about it in books, for example,one I have from the 1950s. Decaying ones, not the salty orange I bought this morning, although I could re-create it here in the room, although it might not be ready by Saturday when I leave this hotel and I might get into trouble. Nothing. Is what I’m working on. I get more out of reading Louise Orrock’s comments than writing anything. Never mind later reading whatever it was I wrote. This comment is now irrelevant. If I ever do post something here again, I will do so only in hope of eliciting further commentary from Louise Orrock. Right now, you’ve got that covered. 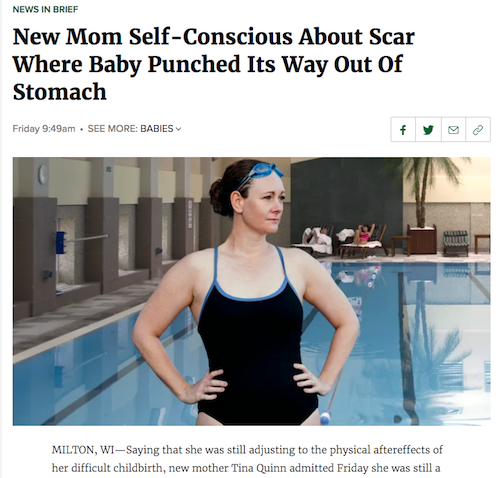 Which is to say, a baby punching her way /ex utero/ is not quite the metaphor for the present state of my homonucleus, or whatever. More like … um … maybe not. This is because I didn’t send a Christmas card this year, isn’t it? I am at the moment writing a lengthy indictment against our century. When my brain begins to reel from my literary labors, I make an occasional cheese dip.